30th Annual Spirit of Service Day Set for Saturday :: RickeyStokesNews.com! 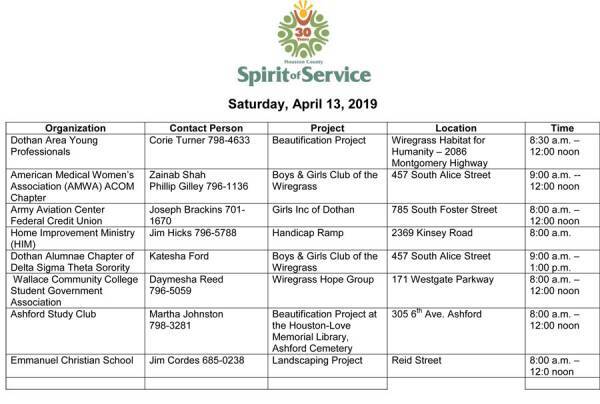 Dothan, Alabama – While several projects have already been completed in recent weeks and additional projects will be completed in the next three weeks, Spirit of Service Day will officially take place Saturday, April 13 throughout Houston County. Starting as early as 8:00 a.m., individual volunteers and volunteers from various organizations and civic clubs will be involved in numerous projects, which include landscaping, painting, and picking up trash. The goal of Spirit of Service is to give everybody in Houston County a chance to volunteer with a project that will help someone in need or participate in a project to beautify our county. In conjunction with Spirit of Service are Houston County Gives Day and Free Community Recycling Day. HCGD will be held Friday, April 12 – 4:30 p.m. – 6:30 p.m. at Eagle Eye Outfitters. Over 40 local nonprofits will share information with the Wiregrass area through an annual exhibition open to the public. The event is designed to serve as an outreach tool for residents who might be in need of the agencies’ services. The Free Community Recycling Day will be held Saturday, April 27, 8:00 a.m. – 11:00 a.m. at the Houston County Farm Center. 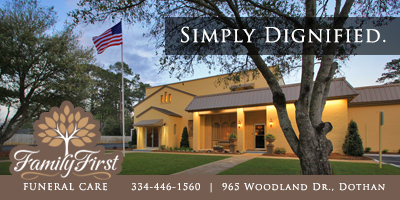 Wiregrass Rehabilitation Center’s Assured Data Destruction and its partners Alabama Cooperative Extension System and Discovery Recycling, LLC will accept electronics and printed materials. Also, the City of Cottonwood’s Annual Down Home Afternoon Parade will be held April 13, at 3:00 p.m. on Main Street. 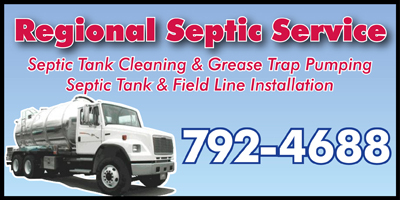 For more information about the parade call Cottonwood City Hall at 691-2671. To register a project or for more information, contact Linda Kelley at the Dothan Area Chamber of Commerce at (334)792-5138.